With proper visualization, we could have a better understanding of the mechanism of Deep Learning. Monitoring training/testing metrics through the learning curve. You know how well your model learning from the data. Visualizing the dynamics under the gradients of a layer with histogram, you know your network is live or dead(gradient). By interpreting the embedding features from a layer, using t-SNE for high-dimensional data visualization, you get intuitions from its representation power. There are way more techniques in visualizing neural networks than the above. So that’s why we want to build a handy tool for our MXNet users. Note that this package could be used in any Python project. Thanks to the community, we already have TensorBoard and it’s easy-to-use and meets most daily use cases. 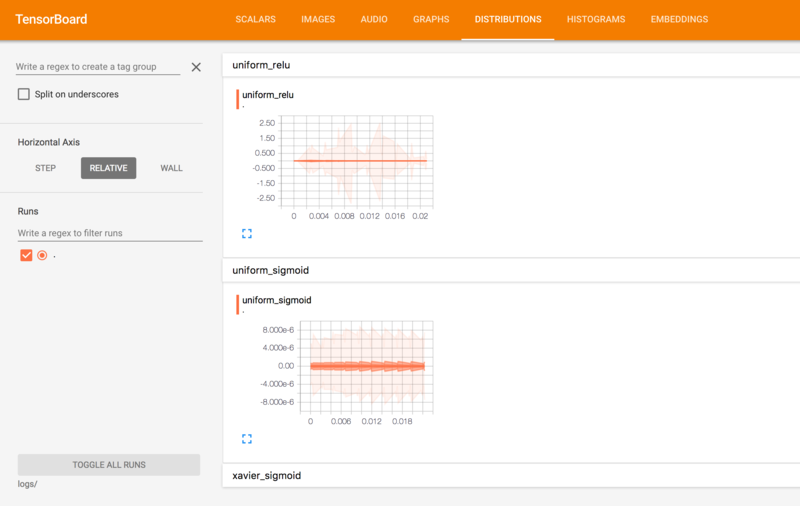 However, TensorBoard is built together with TensorFlow and we have to come up a way to make a stand-alone version for general visualization purpose. It’s my first time to get involved in an open-sourced project like MXNet, and it has some visualization solutions there. I found there’re several similar issues requests for TensorBoard-liked tool, some people want to build the tool from scratch, while @piiswrong asked whether is possible to strip TensorBoard from TensorFlow. I like the latter one, so I created an issue dmlc/mxnet#4003 for discussion, proposed my solution and roadmap towards this direction. Graph. The TensorFlow computational graph. Luckily, those summaries are Protocol Buffers and it makes things easy, which means it could be changed into pure Python. Thanks to the community, I found @mufeili has been working on this feature and TensorBoard has provided a relatively clean API for this purpose, which allows us to get these without running TensorFlow’s operation. The logging part code is placed in tensorboard/python. TensorBoard relies on the Event file, in which summary information is included in this file. Then all dependencies could be found in /bazel-bin/tensorflow/tensorboard, a Python binary tensorboard to launch the app and its dependencies tensorboard.runfiles. However, this package search logic may have some problems if we install from the Python wheel. And we would discuss the solution later. It could be done by assigning binary script entry in setup.py, see tensorboard/setup.py for more. The basic idea of a setup function, in this scenario, is to pack all necessary dependencies and setup the binary file correctly. Ops, back to the FindModuleSpace issue mentioned above. The tensorboard binary file would be copied to /Users/zihao.zzh/anaconda2/envs/tensorboard/bin/tensorboard, for example. But when you launch TensorBoard, it searches the .runfiles in the same directory, so we make a tensorboard/tensorboard-binary.patch and apply this patch in the building process. Add this component as submodule in MXNet. Supports image, video, embedding and even graph for MXNet. Make package installation more easier by providing a pre-built wheel, then users could install this package in one line. Feel free to join us and contribute! Zihao Zheng is an algorithm engineer at AI Lab, Alibaba Group. Before joined the industry, he studied Mathematics at South China Normal University and learned Machine Learning and Computer Science from MOOCs. Many thanks to the community, TensorBoard authors and contributors! !